Flexibility is what MotorsportReg is all about. You build your tribe with a particular experience that is everything from where you promote your events to how you greet people at the event to how you treat folks who run afoul of your rules. 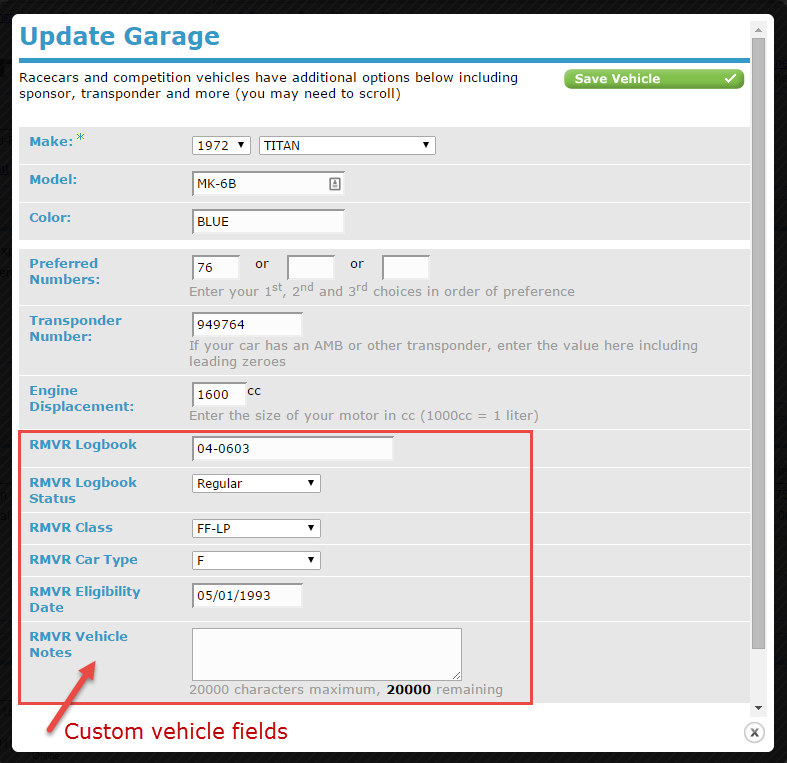 You can customize large parts of the data you gather with MotorsportReg including the person and attendee profiles using our custom question functionality but one category has remained static: vehicles. We collect a wide range of (mostly optional) vehicle details but karting groups want chassis manufacturer, vintage racers want former FIA logbook number and autocross groups want to log modification points for indexed classes. Now you can collect all of those and more by extending the vehicle profile! All the same controls you're accustomed to - whether the participant can see or edit the value, the type of data, accepting values free-form vs. pick from a list - can now be applied to vehicles. Premium plan customers can navigate to "Club Profile" and choose "Vehicle Questions" to get started. There are new corresponding options in the reports to include those custom fields. Thanks to Rocky Mountain Vintage Racing for helping us prototype and test the new feature by tracking additional attributes about their historic racing vehicles as they migrated from their home-grown registration system to MotorsportReg. More complex events take advantage of our "bucketing" approach to breaking up entry lists into groups. We've seen increased (and unforeseen) cleverness use of segments which gave rise to a shortcoming in our reporting: the ability to pick an ad-hoc set of segments to include in a report. Not much to say here other than…. voila! We've been validating organization membership status for years but there has always been an annoying problem: many members open a club membership using their formal name, like "Robert", but register for events and go about their daily business using a nickname like "Bob". This led to regular (and frustrating) error messages for participants in the middle of registering like, "Your name at MotorsportReg.com must match exactly what is on file at <Club HQ>, please change one of them to match". We have taught our verification service some new tricks and gave it a database of common (English, for now) nicknames. Ann will now be recognized for Rosaenn and Rosaenna. And Roxanne! And Roxanna too! For organizations that teach, like High Performance Driving Schools, we have a grid-based screen that helps assign instructors to students in batch. It prevents double-booking, makes sure that every student has an instructor and visualizes the sessions to avoid back-to-back instructing when possible. With more organizations taking advantage of our member types and flexible workflows, we introduced new filtering that lets you match the correct instructors to students. You might want to filter out all waitlisted participants (which is the default) or only work with registrations you previously marked On Hold. Another example would be pairing instructor candidates with senior instructors for mentoring. Briefly, here are a few other changes that resolve feature requests or bug reports. Most of these requests come directly from you! When copying or moving a registration to a new event, the payment account on file is now copied with it (bug fix). Each event came with a built-in forum for participants to get to know each other, coordinate caravans or lodging and share plans for the event. There might have been some occasional trash-talking in there too. These forums were suffering from declining usage and the software we used was not up to our expectations so we've removed these forums for now. We'll consider restoring them in the future if we can find a worthy replacement. Public attendee lists for autocross, rallycross or race events have shortcut links to each group at the top of the page. Those links now include the number of entries in each group and each group now includes a count per class. We heard both from organizers and attendees they want to know how many people will be on track simultaneously and how many will be in their class (often for prize contingency qualifications). We added a new validation rule to require a vehicle model. The field is technically optional as in some cases it doesn't make sense (purpose-built formula cars and karts in many cases). If it's essential you have this field filled out, you can add the rule to your form. Some users on Mac OSX and iOS devices have received an Apple cookie update that prevents them from paying. The symptom is they are logged out when they click the "Pay" button. We identified the issue (thanks to Steve U from Colorado) and have written up a fix. Users of the specific version of Safari will be warned to make the small change prior to entering their billing information. We expect Apple will fix this in an upcoming version of Safari.